New York State’s oversight of hospital consolidation through its Certificate of Need (CON) program does not adequately inform or engage affected health consumers. Created in 1964 to regulate and restrain hospital expansion, New York’s CON program needs to be updated to protect consumers affected by hospital closings, downsizings and mergers. Notify and engage consumers affected by hospital consolidation. Improve CON transparency and consumer engagement when health systems propose takeovers of community hospitals. Add more consumers to CON review board and improve CON process transparency. Ensure CON projects protect access to timely, affordable care. The study found that 41 hospitals have closed across New York State over the last 20 years, and others have eliminated key services, such as emergency departments and maternity care. Yet, state CON does not require advance notice to affected consumers, public hearings in the communities served by the facilities or review of the closing plans by the state Public Health and Health Planning Council (PHHPC) in a public meeting. 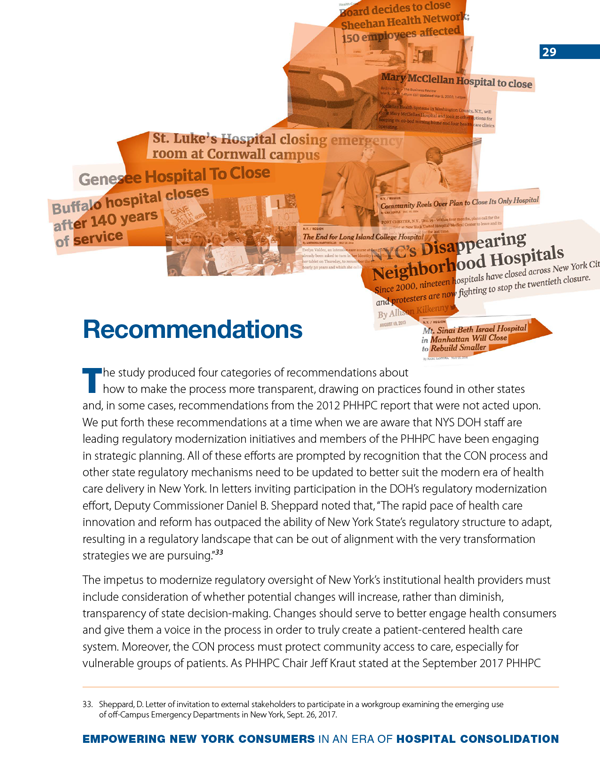 Learn more about study findings and our recommendations to make New York’s CON more transparent, engaging of affected consumers and protective of community access to care.